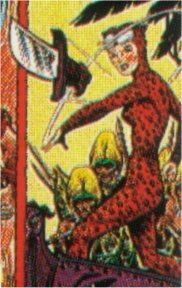 Powers/Abilities: As well as the standard "jungle lord" package of agility, fighting skills, heightened senses, etc, Leopard Girl seemed to be able to control groups of leopards using her "cry of the leopard". Whether this was a paranormal ability, or just a good rapport with the animals, is unclear. History: (Jungle Action I #1-6, ga) Gwen was the assistant to scientist Dr.Hans Kreitzer, who had travelled to the jungles of Africa to conduct research. 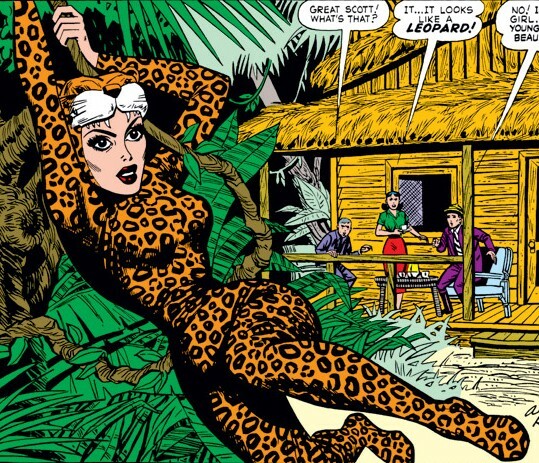 Unknown to the Doctor and her fellow assistant Peter, Gwen maintained a dual identity, the Leopard Girl, feared by criminals and respected throughout the jungle by natives and animals alike. Even the jungle ghosts liked and helped her. She often worked with a pack of leopards whom she summoned and controlled with her "cry of the leopard."